So it seems that I finally found a bit of time and courage to put up a new blog post. I have been so busy at work, that I usually don't have the courage anymore in the evening to sit in front of my computer and draft a new post. I do miss it, however. I also have a backlog of sewing projects that I want to show you, and my personal photographer aka my amazing sister is back from abroad, so I hope to get this going again. For the bodice, I used the bodice pattern of this Burda vintage Capri sunsuit. I didn't have enough fabric to create a full skirt like the Dior dress has, so I drafted the skirt myself by just putting together two rectangles and creating some sort of overlapping box pleat to create the fullness of the skirt. The dress is fully lined as the fabric is a bit see-through between the ruffles, and I added some ruffled mesh strips to the skirt lining, to help the fullness of the skirt. Even though the dress fits really nicely (yay!) and it does keep in place pretty well, I felt more comfortable if I knew there was at least a bit of support in the dress. So I added boning in the side seams to keep those straight up, especially around the zipper. I also sewed in a waist stay, and boy, does that make a difference! The fabric is a bit on the heavy side, and so the waist stay prevents the heavy skirt from pulling the dress down. Big thanks to my sister for taking these lovely pictures! In the last picture, you can see the underlining with the mesh ruffles. It's a bit blurry, but I thought it was a funny picture and I didn't want to keep it from you. Last week I was talking to a friend about a new dress I was making, and he asked if it would be my dress for New Year's Eve - which it wasn't, but that is another story. It made me think of the dress I made last year, and how I hadn't blogged it yet (same goes for the dress I made the year before, oops). So here it is: my New Year's Eve version of the Emma dress by La Maison Victor. The dress is made from a black cotton and the silver fabric comes from a thrifted dress that I cut up. I did not make any modifications to the pattern, but later on realised I should have done an FBA and a modification in the back. The reason I did not do the FBA, is because it fitted wonderfully as long as I was putting the dress together, and it wasn't until it was finished that the armholes were gaping. Oh well. I didn't have time to adjust it, because of course I made it pretty last minute. Another thing I noticed once it was finished, is that the open back was also gaping. I fixed it by stitching it down onto the waist band, and I actually liked the effect of the back panels pointing down on the skirt. This dress came together rather quickly, which was a good thing, seen my timing. It is pretty straightforward to sew, only the fitting in the back might be a bit of a challenge, and an extra pair of hands comes in handy (thanks mom). I'm not sure if I will wear this dress again, because although I really like it, it feels a little bit short. I don't think I will ever get to attaching another skirt to this one, but I might make this dress again in the future. How are you doing? I had a blast this summer. I spent a large part of the summer in Italy and the South of France and had an amazing time. Before I left, I had the time to finish some sewing projects I had been working on, so I could take them with me. You've already seen one of them, the Leila top, and today I'm showing you another one. Much on trend, I decided to make a bodysuit out of red jersey I had left from making a dress (unblogged). I love wearing high-waisted skirts, and a bodysuit would eliminate the 'problem' of tops that keep riding up. I immediately thought of the Knipmode pattern of the Badgley Mischka bathing suit. I had made it before as a top, and I loved the fit and the design of the straps. I eliminated the crossing panels on the front, and instead of sewing the crotch together, I sewed on some snaps for closure. As the fabric is stretchy and tends to keep its shape very well, I omitted any elastics you might normally sew. How are you all doing? I'm currently away on vacation in Italy and I'm having a great time. It has been so hot at times that you couldn't bribe me into touching my computer, so this post has taken longer than I intended. Better late than never, right? And that certainly counts for this pair of shorts I'm sharing today! I actually made those two years ago already... I'm still loving them, though, and I have worn them so many times already, I thought they deserved a little spotlight. The pattern I used is Burdastyle 04/2013 #102. 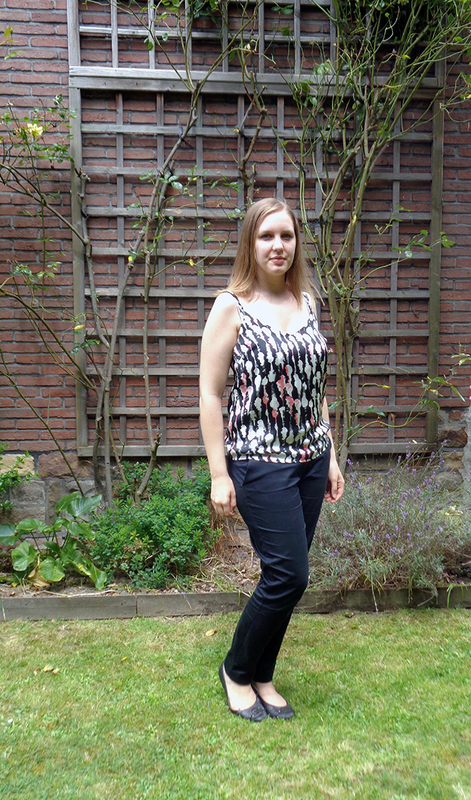 I adapted the pattern slightly to create the scalloped hem, but that really is all I changed. The shorts are lined, fully french-seamed (I was so proud of that) and have pockets. I did make a slight mistake while sewing in the pockets, so they tend to turn inside out from time to time, something I need to pay extra attention to next time I'm giving them a go. The fabric was actually a thrifted skirt that I bought at Think Twice (my favourite Belgian thrift store) and I scored it for 1 or 2 euros. I still have some fabric left over, and I think it might even be enough to make a top. More posts are on their way! As promised, the first one of a number of makes. I finally got around to taking some pictures with the help of my fantastic sister - hopefully, I'll get to take more this week. This top is a very simple pattern, but I really like it. It is the Leila top from La Maison Victor (from the May-June 2015 issue). The only thing I would adjust next time is to make it a bit wider at the hem, so it falls smoothly over my hips. But other than that, I'm happy with the fit, I didn't even need to do a full bust adjustment. I might be making more of these in the future! The only difference in my version of the pattern are the straps. I made double straps and let the middle ones come together at the back. I bought the fabric at Stoffenspektakel, but I don't remember which merchant I bought it from... I think it is a polyester fabric, but it feels nice to the skin and it doesn't wrinkle much, so that is a huge plus! I've already worn it a couple of times and it is on its way to becoming a staple item. I might actually need to make more, haha. This post is way overdue but as I was having exams and I really want to graduate at the end of June, I decided to postpone this post. The weather here has also been aweful and there wasn't a spot in the house with enough daylight to take decent pictures. As I didn't feel like changing 4 times (I took the pictures afterwards) I tried a different setup this time. 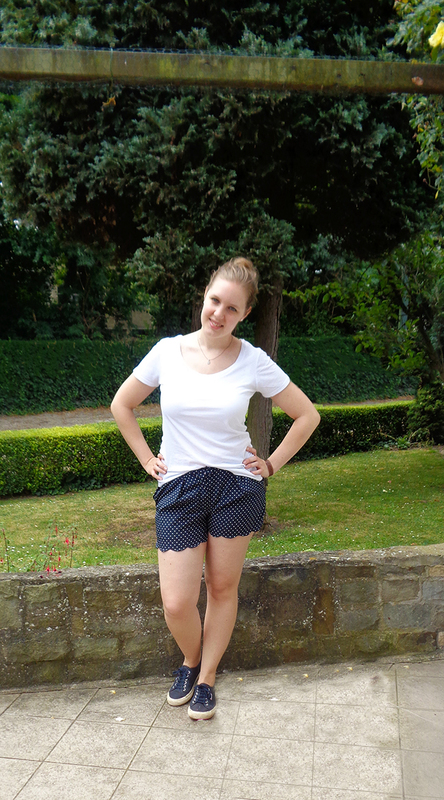 First outfit: Shorts from a Burda pattern (unblogged) and top from Pimkie. Second outfit: LMV Martini dress - I feel like I cheated a little bit with this one, as I wore it three times over these two weeks. It is just soooo comfortable to wear, so it is kind of my go-to dress when I don't need to leave the house but don't feel like wearing sweatpants either. 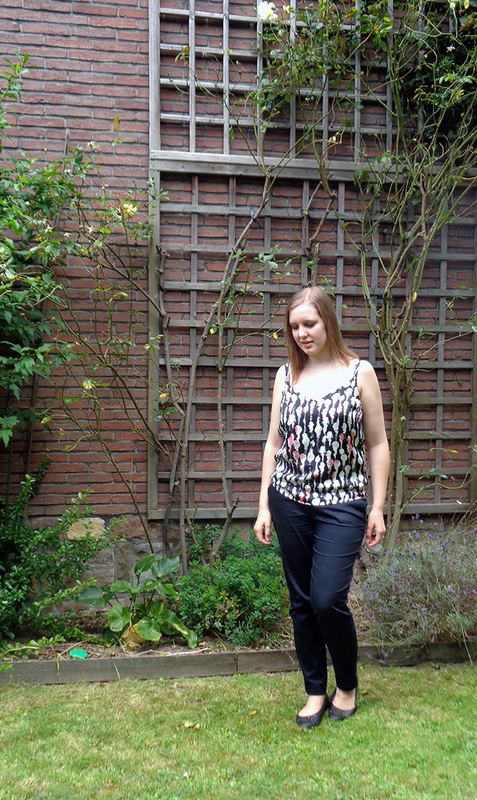 Third outfit: Knipmode top that I also wore in the first half of may and a blazer from Oltre. I wore this with black skinny jeans, that I am currently altering (they have a bit of gaping in the back - ah, the perks of being able to sew). 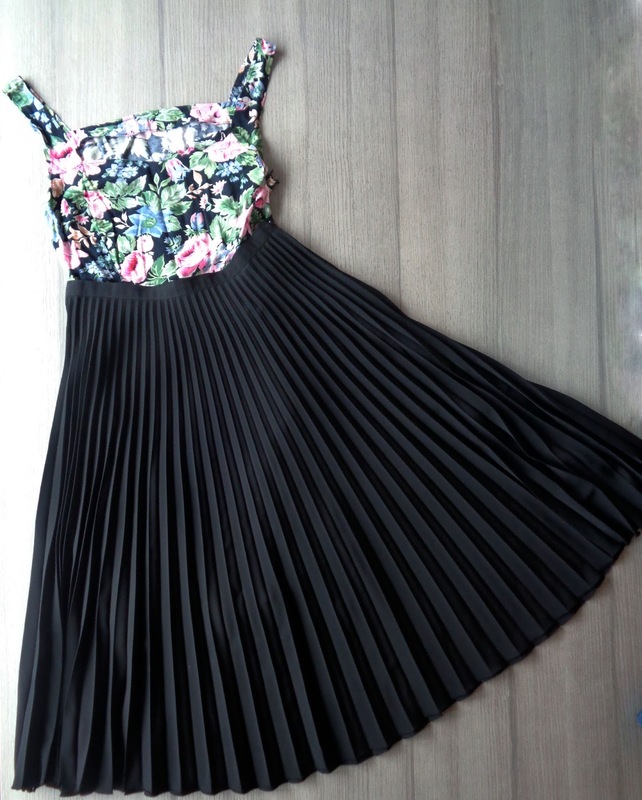 Last outfit: The very last thing I wore for MMMay this year is my floral burda dress, worn as a top, with this amazing pleated skirt that I thrifted for two euro (!). This outfit is a favourite, it has a bit of a Dolce & Gabbana feel to it and I feel ultra feminine and summery while wearing it. I don't sew enough clothes for in between seasons or bad weather and normal occasions. I have three gowns and a dress that only suit a special occasion (I made those for my student gala) and one dress that is appropriate for events like new year's eve. Hence, I can't really get away with wearing them during Me Made May, haha. I should also look into separates that I would be able to layer, so I can wear them when the belgian weather behaves like it currently does - lots of wind and rain. I am very happy I took part in MMMay, as I have not only renewed my love for some pieces, but I also tend to wear my me-mades more now. And yay, I stuck to my challenge! Now, onto my next project and pile of UFOs*! * For my non-sewing friends: UFO = Un-Finished Object, meaning my pile of clothing pieces I once started to sew and then abandoned half way because of a newer, shinier project. Yes, I am guilty of that. May is already halfway, so it is about time I share my outfits for the challenge. So far I have kept up with it and have worn 3 me-mades or refashioned items per week. It made me realise I have mostly sewn things for warm-weather and special occasions. Luckily, we've had some good days lately, so I have been able to wear some items without the trouble of adding layers. Meanwhile, I've started to sew a new dress, and I have some more thrifted clothes that are waiting for me to refashion. Hopefully I'll be able to share some of those as well in May!